Unfold the pastry sheet on a lightly floured surface. Cut the pastry sheet into 3 strips along the fold marks. Place the pastries onto a baking sheet. Bake for 15 minutes or until the pastries are golden brown. Remove the pastries from the baking sheet and let cool on a wire rack for 10 minutes. Split each pastry into 2 layers, making 6 in all. Reserve 2 top pastry layers. Spread the chocolate ice cream on 2 bottom pastry layers. Freeze for 30 minutes. 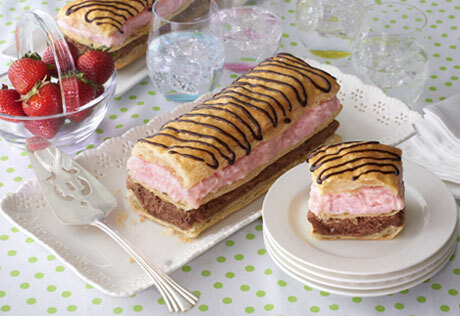 Top with another pastry layer and spread with the strawberry ice cream. Top with the reserved top pastry layers. Freeze for 30 minutes or until the ice cream is firm. Drizzle with the chocolate topping. Recipe Note: For easier slicing, use a wet, serrated knife.